A Diamond Select Toys Release! By the Vishanti! 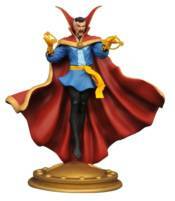 The Marvel Universe's Sorceror Supreme, Doctor Strange, is now the latest in DST's new line of 9-inch-scale Gallery PVC figures! Depicting the sorcerer hovering in mid-air over a giant Eye of Agamotto and casting a complex spell, this comic book-inspired figure features a detailed sculpt and collectible-quality paint applications. Figure is in scale to all Gallery and Femme Fatales PVC figures, and comes packaged in a full-color window box. Sculpted by Phil Ramirez!